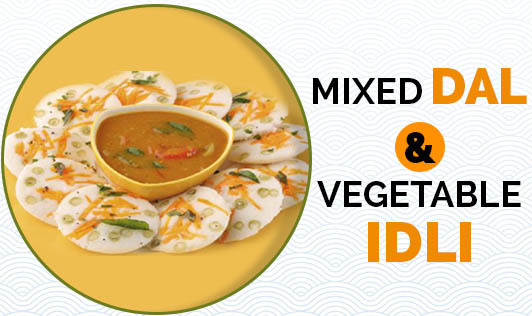 These nutritious idlis are made with 3 different types of dal and are a little heavier than the usual idlis. However, they are very nutritious as along with dals they also contain vegetables like fenugreek, green peas, and carrots. It is an excellent dish to have during early pregnancy as it rich in nutrients like iron, folic acid, vitamin C, and fiber. You also make delicious pancakes of the same batter instead of making idlis. • Wash the dals thoroughly and soak them for at least 3 to 4 hours. • Drain and grind the dals to a smooth paste, use approximately ½ cup water to make the paste. • Add the chopped methi leaves, coriander, green peas, carrot, chilies, onions, and salt, and mix well. • Use water (as required) to make a thick batter. • Pour the batter into the greased idli moulds and steam them for 10 to 15 minutes until done. • Serve hot with chutney.